- old (from Ordos Remake) and new music. Do not need to do the defend area if is small map. And that makes a complicated game. I still need to catch up on a ton of stuff, but I shall add this to my to-play list. Wow, I did a quick look of the maps and they seems really small; I wonder how the AI will behave. When I finish the campaign I am playing right now I'll play yours. I wonder how the AI will behave. They will react to you if you are near and it won't be easy. But this way you can weaken them. You must keep distance. The maps are very small and easy for your enemies to attack you. But this is a minus of small maps. Maps with missions are increasing. That means the maps will not be all the time small. I am playing this right now. Wow, so far this is the shorter campaign I ever play. I already beat 7 missions in a very short time. It's in your line of work. The type of map I was expecting (player recieving units constatly, the enemy attacking constatly). Nothing wrong with this. Simple map. Some harass at the beggining but nothing too heavy. Just want to point that you can build any type of building to update the tech (I'll said silo because it's cheap), but also selling a building do the trick. Good enough mission. I underestimate the enemy, and went through the middle of the map. 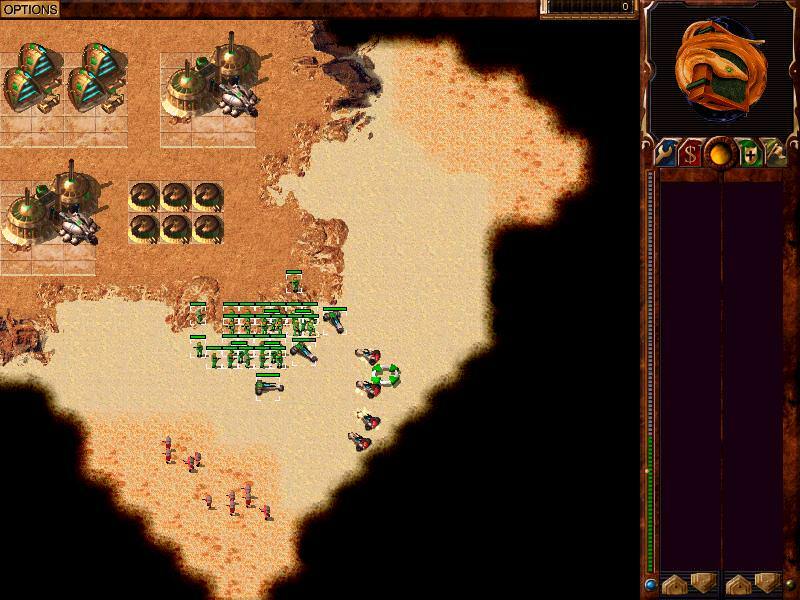 A bit of bottleneck and figthing the two enemies cost me lots of losses, but Didn't needed to reload the map; I just group and attack the Harkonnen first as far as possible from his allies and that's it, easy to win. Ok, here it's s a big problem with the map being so small. 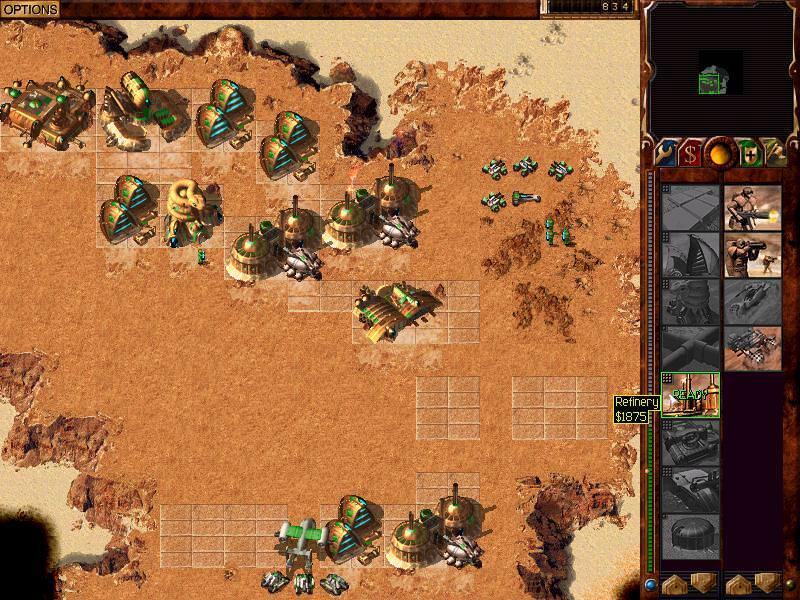 The problem it's: I placed a refinery in the right-down place, and the enemy send all his defensive units against me. After that first wave died, except for the other attacks by reinforcements destroying the enemy base was not even a problem. They just keep sending units 1 by 1, attacking my refinery (because that building was too near to them), dieing in the process, repeat. With no defensive units besides the pre-placed units (which you can take by rock-paper-scissor tactic) I defeat the main factories with only 15 units. Which it's a shame =(. I'l probably play this map once again and wait until the time runs out. Again, huge problem with the map size and the way the Harkonnen base it's deployed. I was looking into my own rock area (I didn't even went far from that), but that was enough to get the attention of a Harkonnen light infantry. My raiders kill him and that bring the rest of his units. From that point Harkonnen were sending his units one by one until depleting all his money. With no other external enemy attacks or defenses only took me a couple of raiders and 6 trooper/infantry to do the most damage. Only the Atreides attack me once. Ps: I am playing all the maps blindy, so I am not even trying to exploit AI weakness or something. They just happen naturally. The size of those small maps and the way you placed some enemy bases it's making the AI to do weird stuff even withouth forcing it. Will be more missions, longer and not easy. At this time, I do not have time to continue with this campaign. I just made easy (only in beginning) missions like the original. Yes it is true. In the beginning I thought that building was needed. Yes, small maps have a problems. But it looks more interesting. Because it's not so easy at the beginning. But then the enemy is easier to beat. You're right. This is not a good decision to do small maps. But this campaign will be with small maps. And the maps are growing with missions. How many? Because right now there are 10 and were still at tech 3. Because it's not so easy at the beginning. But then the enemy is easier to beat. Not really. Mission 7 it's the easiest mission (except for mission 2). Having the enemy coming 1 by 1 it's just too easy. Mission 8 to 10 were fine, but mission 10 it's too unforgiving. I started the game - enemy first wave - I loose. I didn't even have time to rush the barracks, so I needed to restart and "cheat" by placing my units very close to the enemy, so I could kill them as soon as they were dropped. Even then I didn't win for that much. The rest of the map was ok. Overall so far the campaign it's good (At least it's quick and don't take too much time to beat the missions). I am going to replay the the snowy map and trying to survive until the time runs out, but technically I ended your unfinished campaign. I can't answer because I don't know. But should be 20 - 30 missions. And you had to do that. The mission 10 already Hard. But mission 11 will probably be easy. I'm stop with mission 12 (need conditions). But now I do not have time, because the mission is not simple. In mission 6 you will get reinforcements (will be ally). But this mission have two options: wait (defense/protect) or attack and quickly complete the mission. The other part will not be so fast. When Ordos becomes strong (will have all the things). It will be very hard to beat the enemies. Because enemies will have very large reinforcements (unlimited).